As sisters, Nicole and Sofi grew up in a two-parent, middle class family. From the outside looking in, things appeared normal and healthy. But for Sofi, life was very difficult. Her sister bullied her, stole prized possessions, would lie and blame Sofi for things that went wrong, physically hit her, and destroyed some of Sofi’s things. Yet, Nicole seemed to charm their parents, constantly making Sofi out to look like the dangerous one. Finally after Sofi left the household, she began to research her sister’s behaviors. She came to believe that Nicole had Narcissistic Personality Disorder. Nicole’s need to be superior, right, or in charge all the time limited the possibility of any real reconciliation between them. Instead, Sofi desperately tried to appease Nicole to keep the peace while Nicole played the victim in front of their parents. This switchback tactic emboldens the narcissistic behavior even more, further convincing Nicole of her faultlessness. Any threat to Nicole’s authority only repeated the cycle again. An upsetting event occurs and Nicole feels threatened. It could be rejection, disapproval, embarrassment in a social setting, jealousy of her sister’s success, feelings of abandonment, neglect, or disrespect. Sofi, aware of the potential threat, immediately becomes nervous. She knows something is about to happen and begins to walk on eggshells around her sister. Most narcissists repeatedly get upset over the same underlying issues — whether the issue is real or imagined. They also have a tendency to obsess over the threat over and over. After feeling threatened, Nicole engages in some sort of abusive behavior. The abuse can be physical, mental, verbal, sexual, financial, spiritual or emotional. The abuse is customized to intimidate Sofi in an area of weakness especially if that area is one of strength for the narcissist. The abuse can last for a few short minutes or as long as several hours. Sometimes a combination of two types of abuse is used. For instance, Nicole would begin with verbal belittling to wear out Sofi. Followed by projection of Nicole’s lying about an event as if Sofi did it. Finally tired of the assault, Sofi defensively fights back. This is when the switchback occurs. Nicole uses Sofi’s behavior as further evidence that Nicole is the one being abused. Worse yet, Nicole believes her own twisted victimization by bringing up past defensive behaviors that Sofi has done as Sofi initiated the abuse. Because Sofi has feelings of remorse and guilt, she readily accepts this warped perception and tries to rescue Nicole. This might include giving into what Nicole wants, accepting unnecessary responsibility, placating Nicole to keep the peace, and agreeing to the narcissistic lies. Once Sofi has given in or up, Nicole feels empowered. This is all the justification Nicole needs to demonstrate her rightness or superiority. By contrast, Sofi has unknowingly fed the narcissistic ego and only to make it stronger and bolder than before. But every narcissist has an Achilles heel and the power they feel now will only last till the next threat to their ego appears. 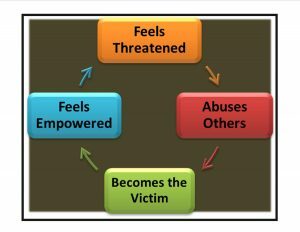 Once the narcissistic cycle of abuse is understood, Sofi was able to escape the cycle at any point. She began by coming up with strategies for future confrontations, knowing the limitations of her sister, and having an escape plan in place. This cycle does not need to continue forward.